This guy wants to be king of the legislature. An Illinois lawmaker is baffling his fellow politicians by trying to push through a law banning the sale of lion burgers. Rep. Luis Arroyo (D-Chicago) wouldn’t say where he thinks lion meat is being sold, but he’s so sure it’s on the menu somewhere that he wants a tough law. After ravaging crops in the Egyptian Nile valley, swarms of locusts have crossed the border into Israeli territory in the south near Kmehin and the Gaza strip. Thousands of the insects crawled in from the Sinai desert into Israel and Gaza, ready to eat every plant on their way.The Israeli Agriculture Ministry is on high alert and is taking steps to combat the locust attack by spraying pesticide. Forget Google Glass, Google’s got sneakers now. Well, at least it does at SXSW (South by Southwest). No, the search giant isn’t planning to get into the sneaker or footwear business, but to showcase its new advertising innovation program called “Art, Copy and Code” the company has hacked together a crazy pair of sneakers. “The Talking Shoe is an experiment in how you can use connected objects to tell stories on the Web today,” Aman Govil, lead of the advertising arts team, told ABC News. 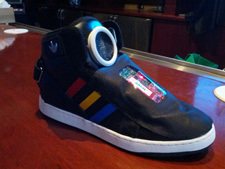 Govil’s team at Google took a few pairs of Adidas sneakers and crammed in a small computer, an accelerometer, a pressure sensor, a gyroscope, speaker and Bluetooth. The shoe can tell what you are or aren’t doing and can then relay that information to your phone via Bluetooth or to you via the speaker in the top tongue of the shoe. The idea is that the shoe would function a lot like many of the fitness gadgets out there today that attempt you to motivate you more. When you have been sitting for more than an hour it might yell at you to walk around. But in this instance, Google’s really thinking along the lines of what brands could do with this sort of technology. Beyond that there are social media marketing ideas. Govil told us to imagine if a famous athlete, say Serena Williams, was wearing these and automatically updates from the shoes were flowing into her social media accounts with information about how fast she was moving. Can’t get rid of that paunch? A Chicago-area gym suggests working out with your pooch. K9 Fit Club offers bow wow boot camps and other classes for people and their dogs to exercise together in Chicago and nearby Hinsdale, Ill. The fitness center opened last year after founder Tricia Montgomery exercised with her dog and lost 130 pounds. Montgomery says her late basset hound, named Louie, lost 22 percent of his body weight. Fans of the gym say classes are beneficial to both man and man’s best friend. People who work out at K9 Fit Club say exercising with their dogs keeps them motivated.